Well, I took the plunge today and painted the Temple Court backdrop a “sky” blue. Since the last post where I showed the completed backdrop installed, I have finished the task of filling and sanding the joins in the MDF. I used a final finish topping compound from Gyprock. 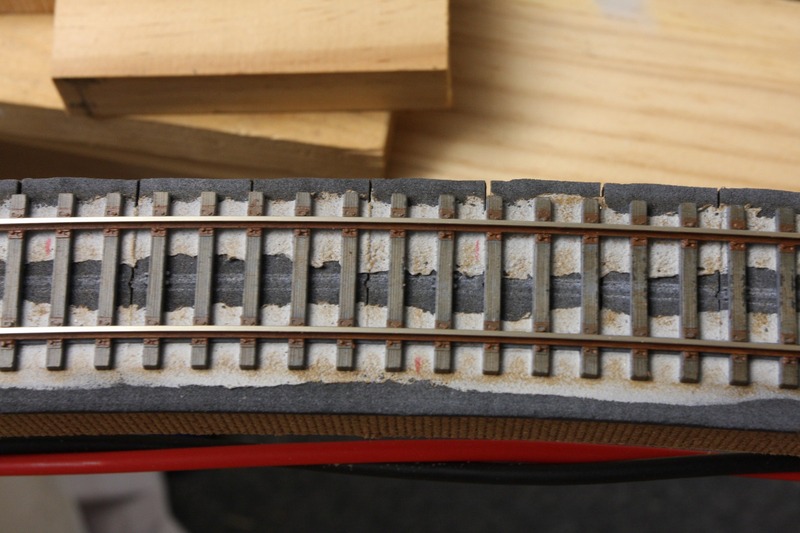 A couple of layers were done to ensure a smooth transition over the join. 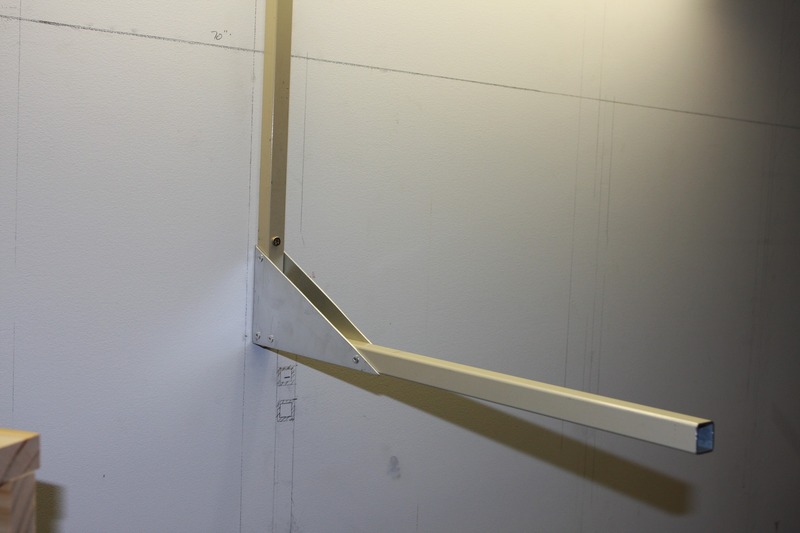 Some mesh jointing tape was also used to help prevent cracking of the join. Once sanded smooth, an undercoat was applied. I had recently been pondering the option of a painted backdrop or a photographic backdrop in this section. There are a number of products available with Australian scenes, but I just couldn’t decide on one that I thought would look right. In the end, I have decided to have a go at a painted backdrop. It will most likely end up just being the sky with some painted clouds. Below is the result of one coat of sky paint this morning. The colour is Dulux ‘Shimmer Half’ A339. I used a foam type roller which hopefully won’t leave much of an ‘eggshell’ type surface. Next step is to try painting some clouds using a technique shown on Trainmasters TV. I recently subscribed to this paid service. I signed up for the two year option. It’s not bad value at $3.50 per month. I have found that not many episodes interest me, but the ones on weathering etc have been interesting. I’ll explain about the cloud painting in the next post. Hopefully they will turn out OK!! Since my last post on Temple Court, I have been busy continuing with benchwork for the backdrop in this section as well as installing some upper deck supports. 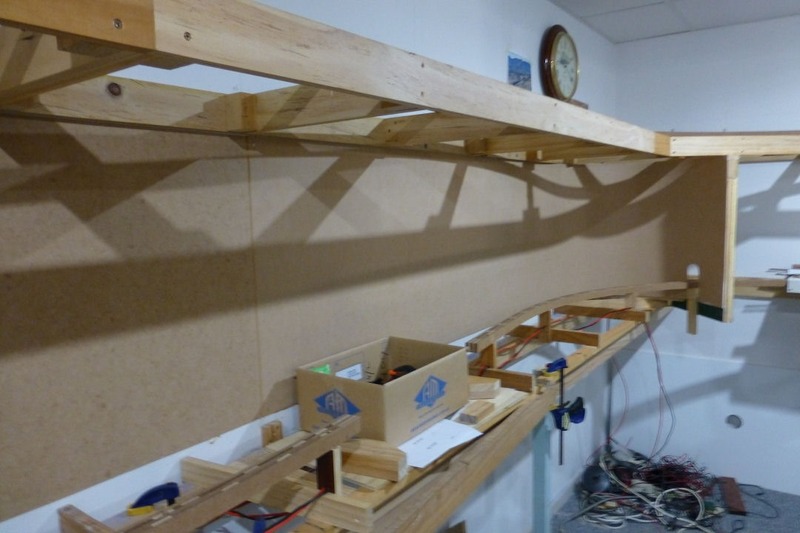 I also added extra bracing back to the walls to strengthen the whole thing. I have had to do quite a lot of thinking about the deck separation and depth of scenes around Temple Court, as, for me to continue with spline construction up into Ardglen, I needed to have some supports in place. 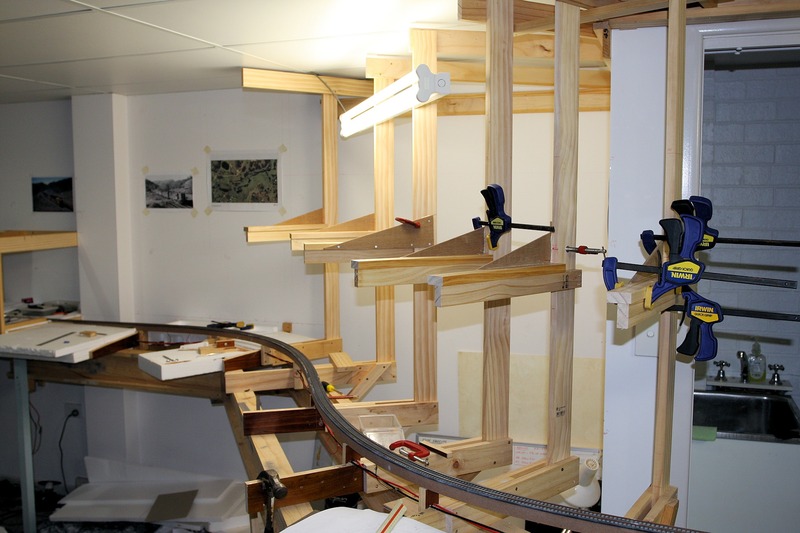 This meant working out a bracket design that would support the spline and scenery, as well as maximising deck separation below to Temple Court. 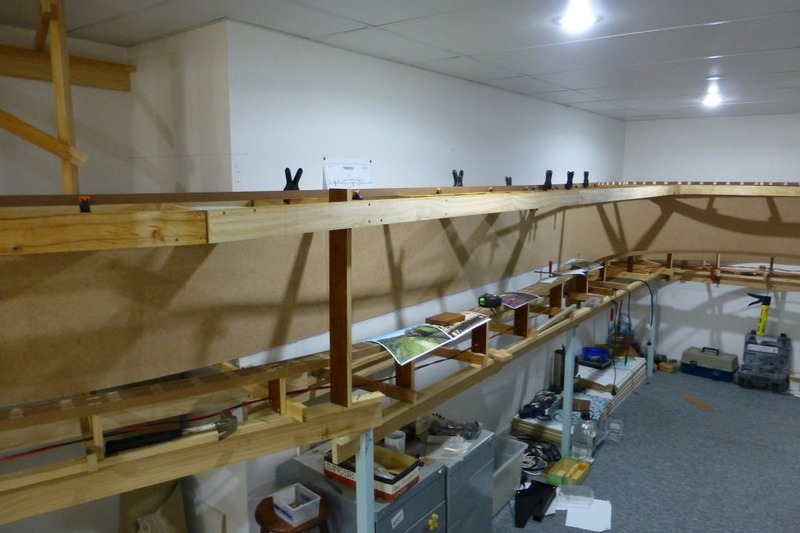 I always had the idea of making the upper deck brackets out of 20mm square steel tube, mainly to maximise deck separation, but also because I had heaps of the stuff left over from an old balustrade system from around our outdoor deck. 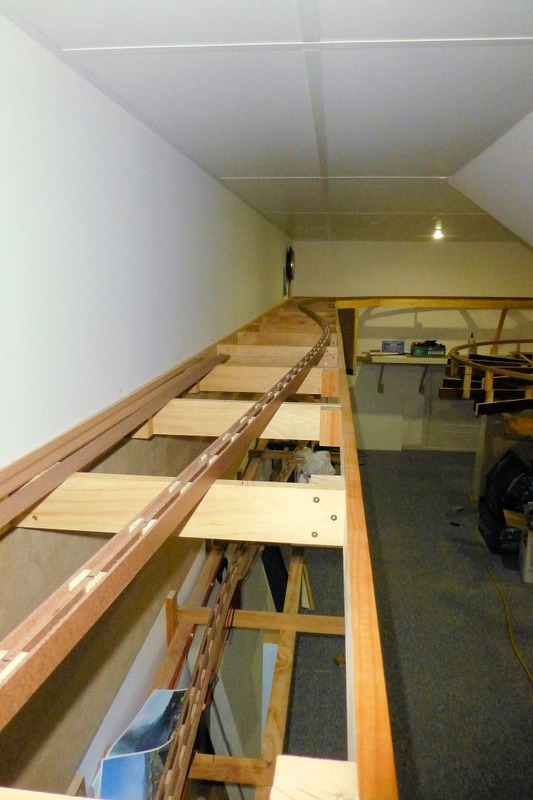 As it turns out, at least in this section, I decided to use only a few steel brackets, as I could see issues with fixing future timber risers to the steel tube. Anyway, these ones will be a test for future supports under Pangela. 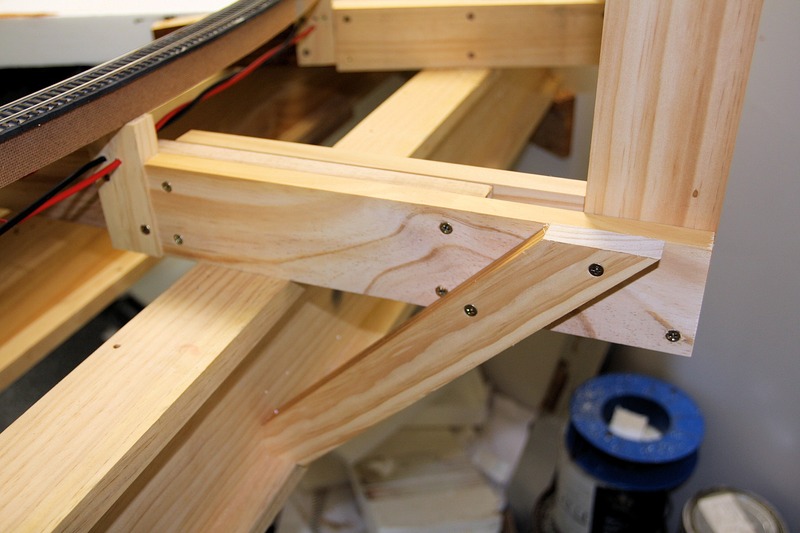 I ended up making the rest of the supports from 2×1 DAR pine screwed together in an inverted L shape. 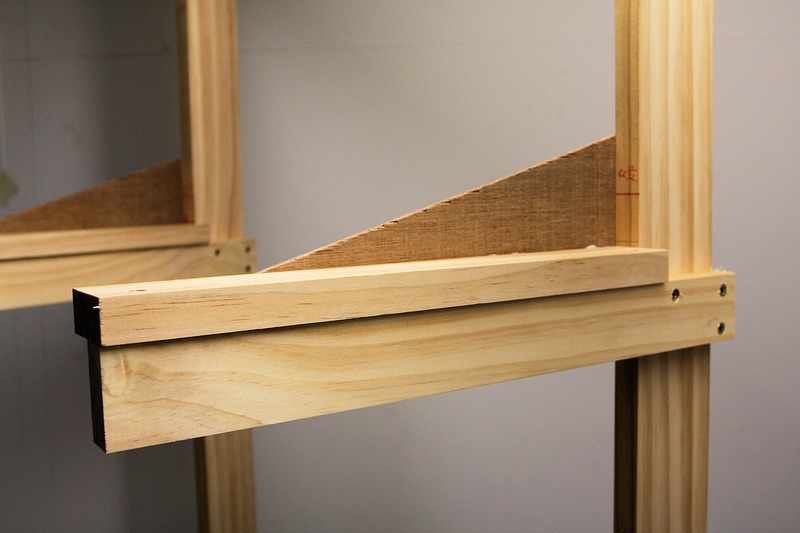 A 6mm ply brace was also glued and screwed to these supports. 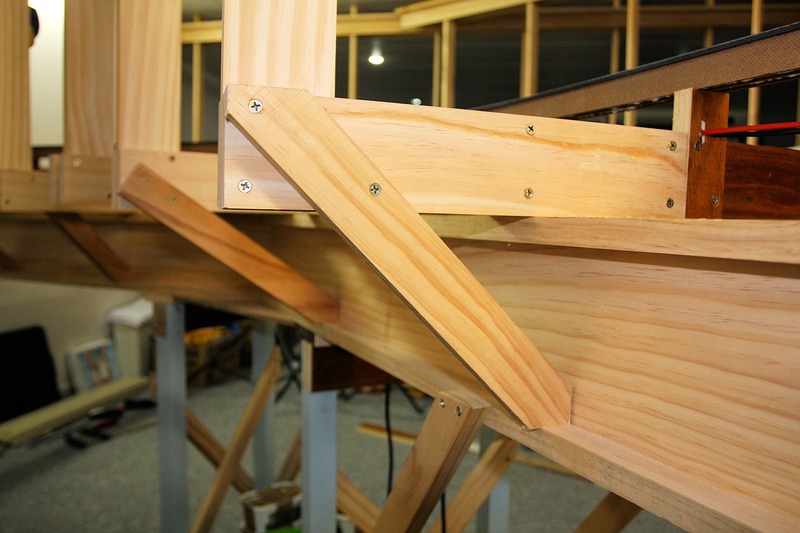 These supports are placed at roughly the elevation of the spline at each location. I was going to make them exactly at the elevation, but thought it wouldn’t leave any room for adjustment to the correct height. 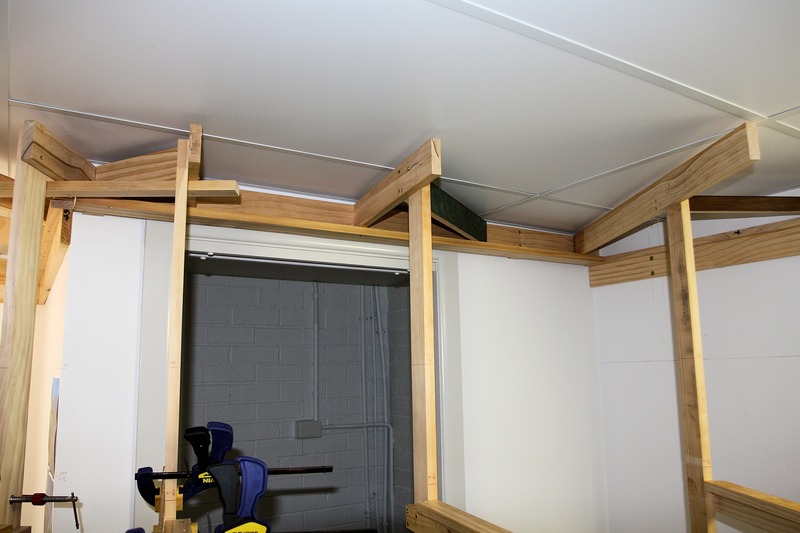 This will be achieved with timber shims. 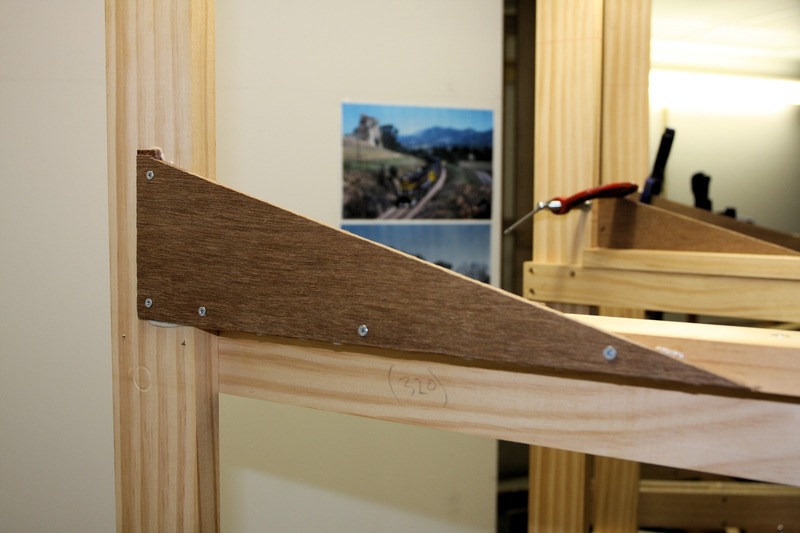 The supports are just long enough so the spline will be attached close to the end. Another piece of 2×1 will be attached later to extend out for the fascia support. 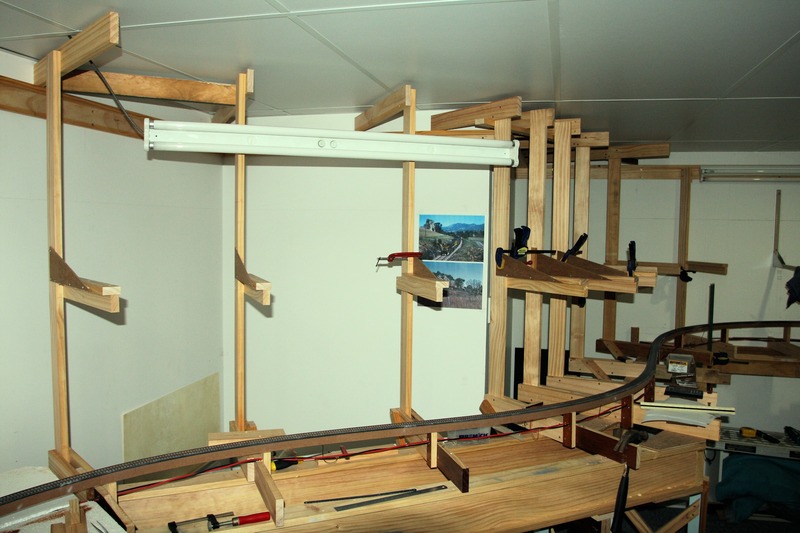 This design was done to ensure maximum scenery depth below track level but also to maintain maximum deck separation. I wasn’t concerned about the angled brace being high at the back, as in this part of the upper deck scene, there will be hills pretty much the full height of the backdrop. The above two photos show the section ready for backdrop installation. 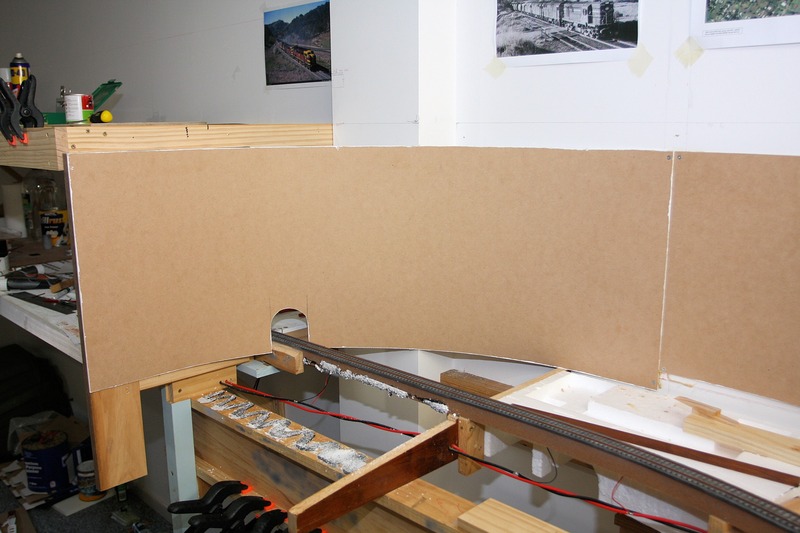 I have chosen to use 3mm MDF. In this section, the backdrop is about 400mm high, so out of a 2440 x 1220mm sheet, I was able to get three sections of backdrop for the full length of this scene. 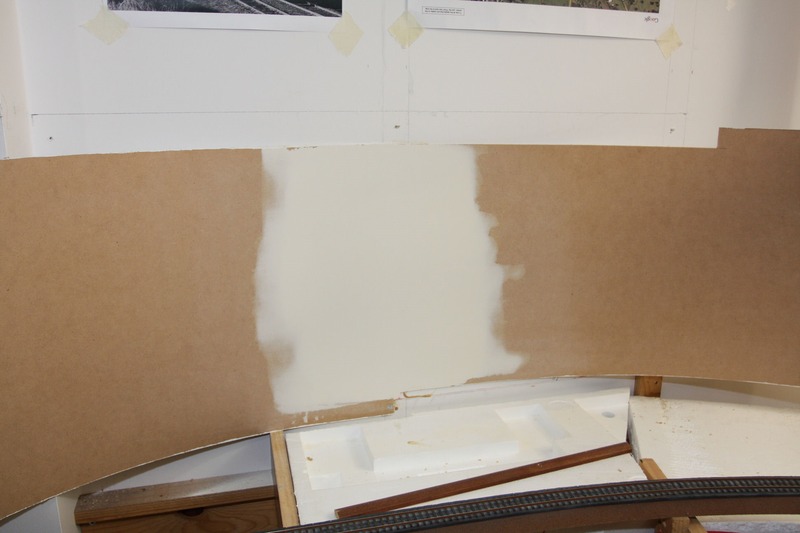 Prior to installing the MDF, the rear of each sheet was painted in an undercoat to seal the MDF, so as to prevent any possible ingress of moisture. I was unsure whether I would have to worry about it, but better to do it now than later. The above two pictures show the curved backdrop at either end of the section. 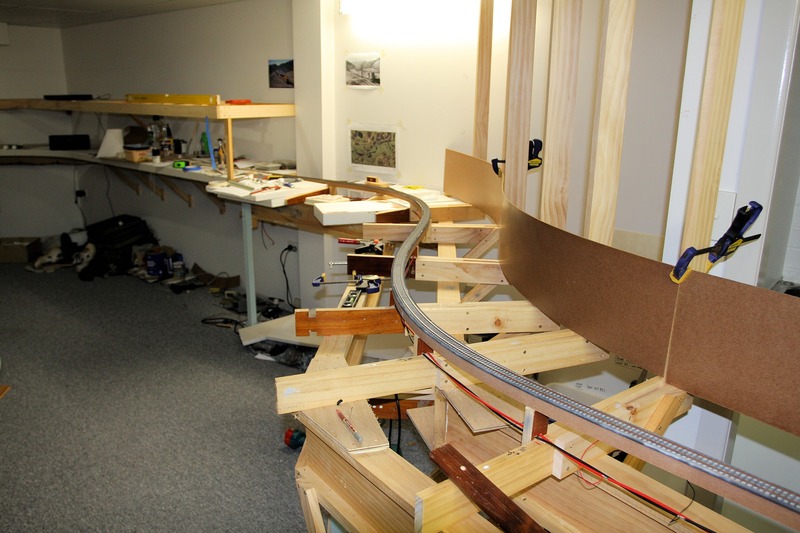 The left hand shot is at the Down staging yards and the right hand shot is leading to the helix. 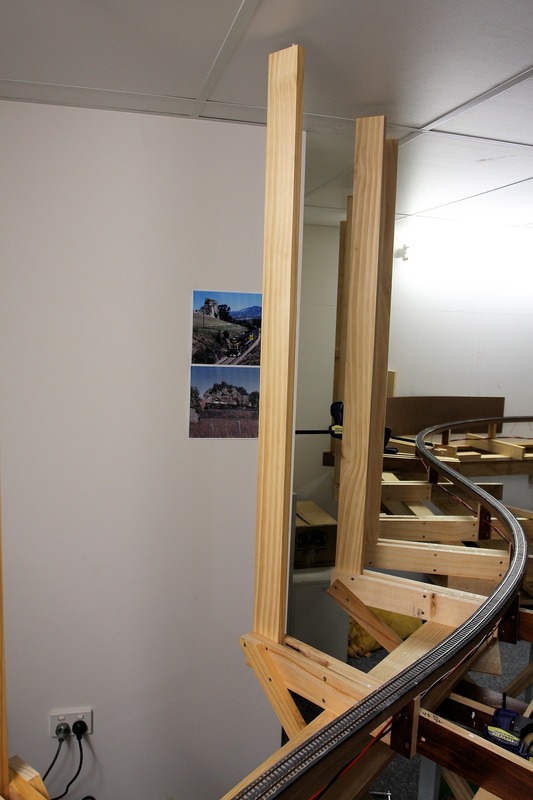 The shot above shows the second section of backdrop being held in place with clamps and pieces of 2×1 whilst the adhesive sets. 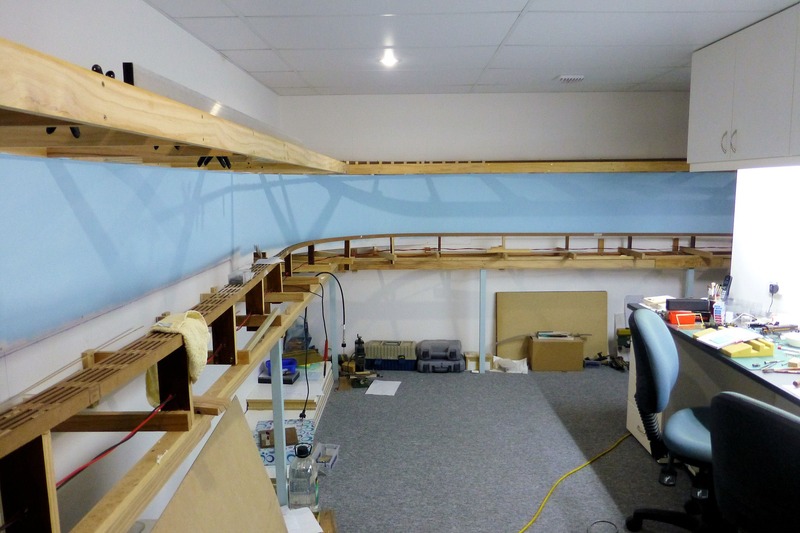 The clamps were left in place for 24 hours. I used construction adhesive, and was planning on using only that, but have since decided to also screw the MDF to the supports at the top and bottom. These screws will pretty much be hidden behind scenery and the upper deck pelmet. The shot above is a panorama view of the Temple Court backdrop as it is now. 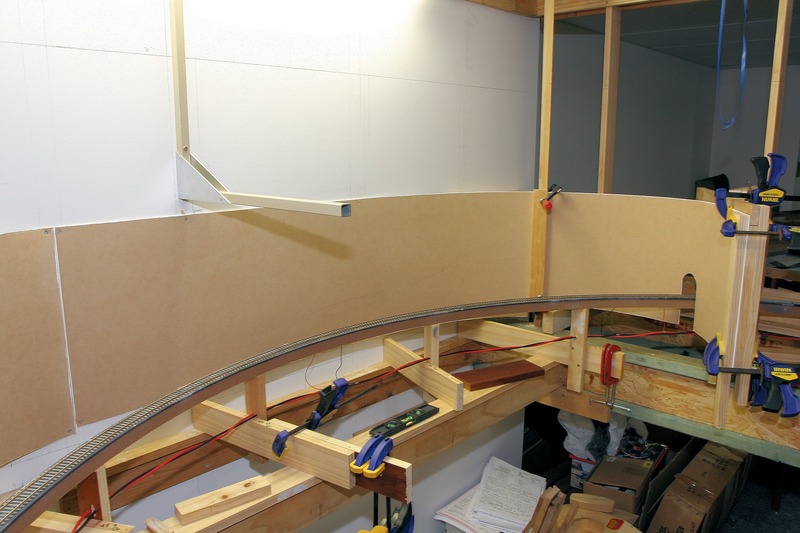 I have started to fill and sand the joins in the MDF. Next stage will be to paint this in a “sky” blue. Since my last post, I have completed the painting of the CV track in the Temple Court section. I pretty much continued with the same colours and techniques as described in the previous post, and am pretty happy with it all. 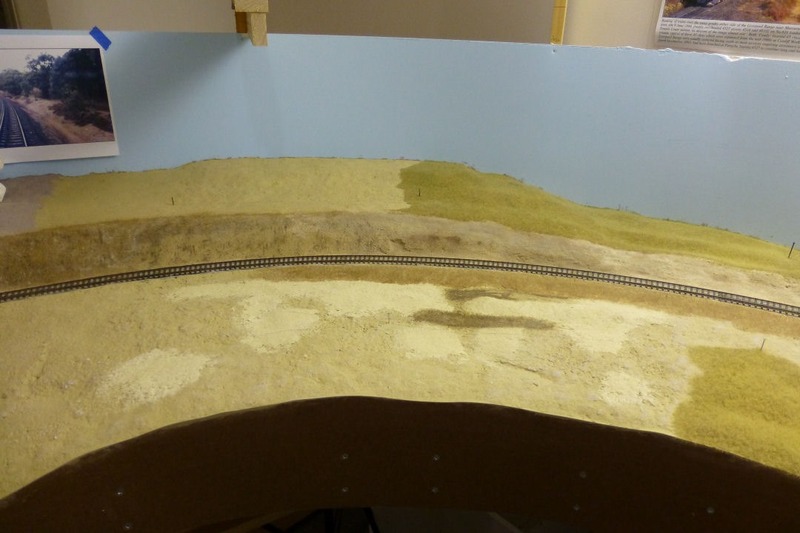 The section is now ready for ballasting but this won’t happen until I have the scenery in place. 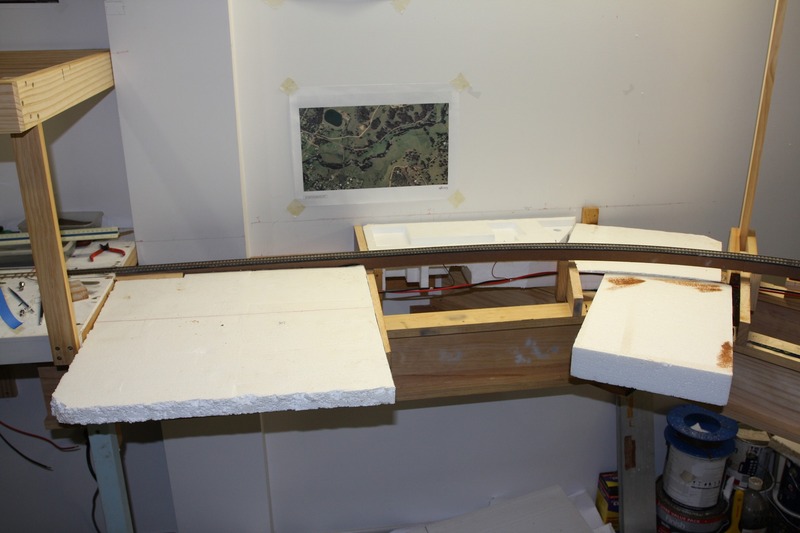 I had also started fitting some styrofoam in place for the scenery base, but realised I couldn’t do much more until I had the backdrop supports installed. At this point I was unsure of how much scene depth I was going to have in this area. 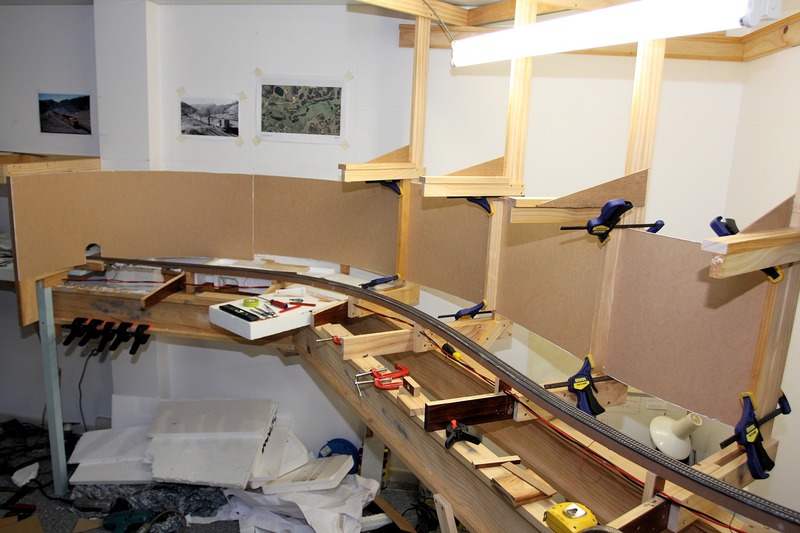 The upper deck that will carry the track coming into Ardglen will be fully supported on the main benchwork in this area. 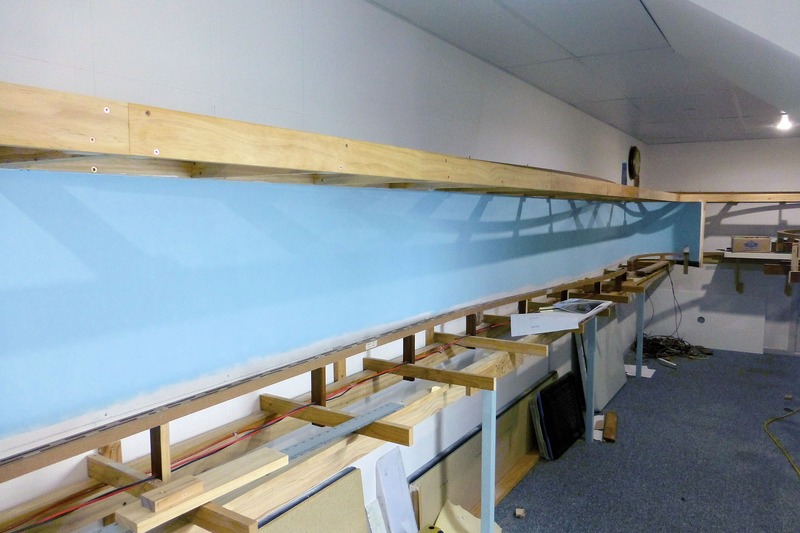 There will be no anchoring of benchwork to the ceiling. 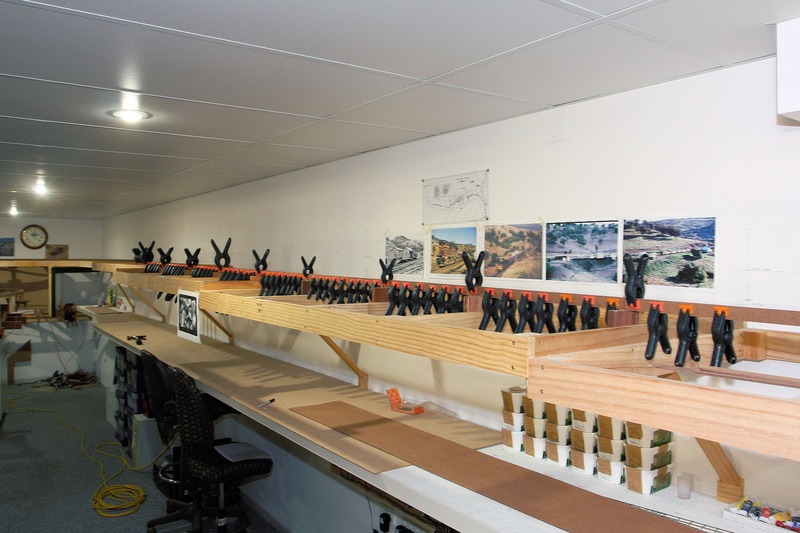 Supports were made from 70×19 DAR pine and cantilevered off the existing joists supporting the Temple Court roadbed. 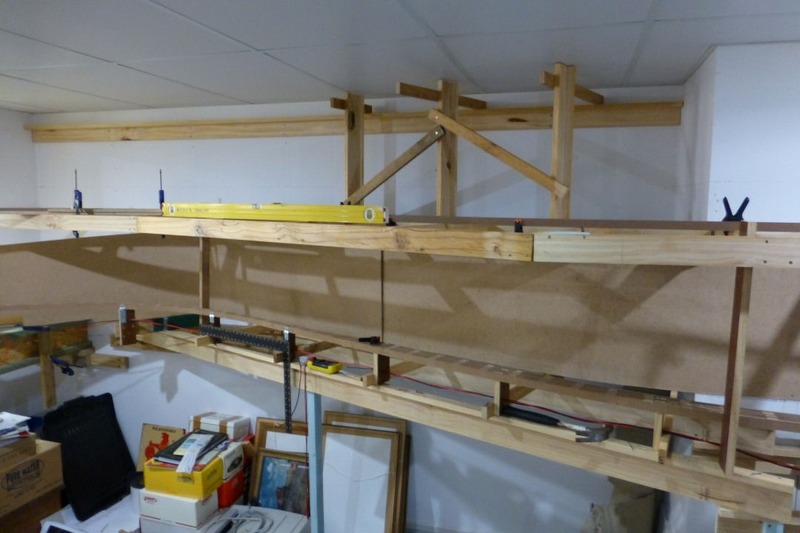 Even though the cantilevered joist length was short, I decided to install angle braces back to the main beams. The whole weight of the upper deck and fascias will be supported by these timbers. 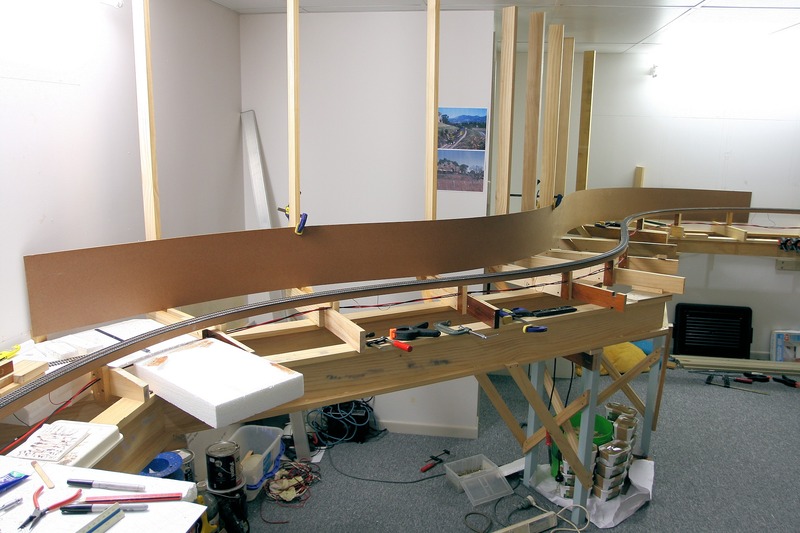 Yes, it’s probably over-engineered, but better to do it now than have problems later on. To finish off, a couple of shots of the section with some masonite temporarily clamped in place so I could get an idea of how it will look. 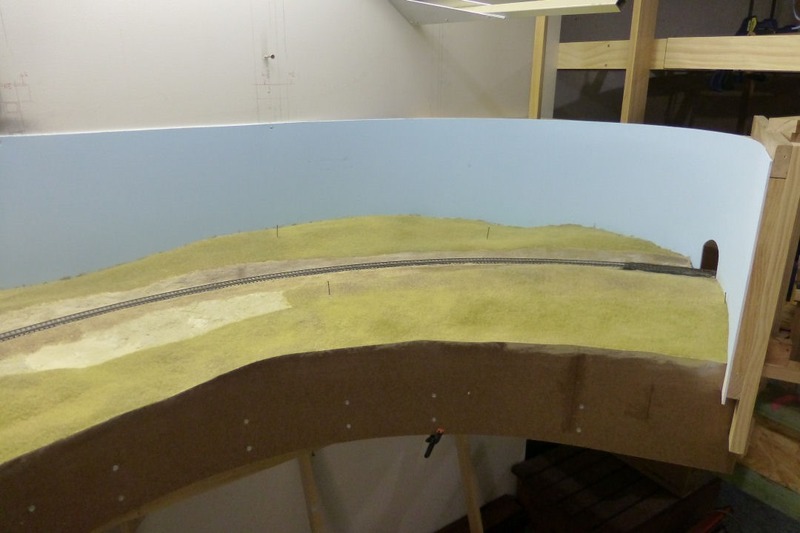 I am thinking the next stage will be to actually fit the backdrop sheeting in place so I will have something to fill with foam to begin scenery shaping.